Spring is in its full, world around us is colourful, sunny and smells great. Our skin could use some highlight and freshness. Bourjois thought about it and that is why we can now buy two new cosmetics: City Radiance foundation and Radiance Reveal under eye concealer. How do both those products work? 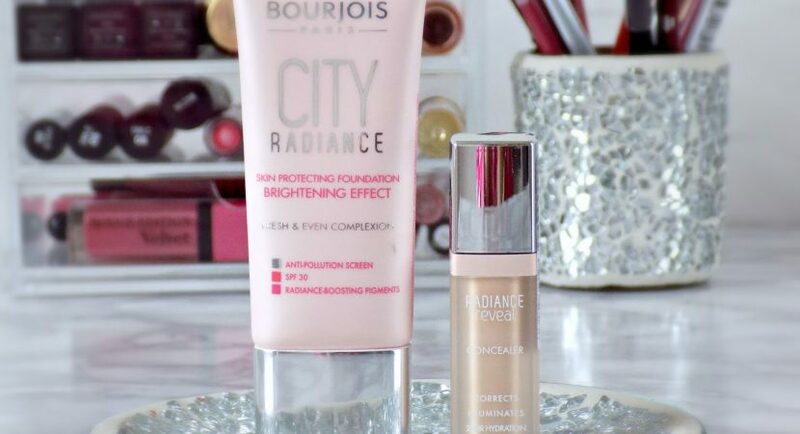 City Radiance foundation from Bourjois consists of light formula and delicate consistency. It provides skin with silky finish, natural glow and fresh and healthy look. It contains shimmering pigments, which reflect sunlight to ensure make-up with radiant look. City Radiance foundation from Bourjois protects skin against premature ageing, aftersun discolourations and small wrinkles. Shade of Bourjois City Radiance blends with skin complexion, gives medium coverage and administers quite well, while preventing mask effect. Right after application it dries, doesn’t rub off during the day and perfectly composes with powder, blusher or bronzer. Under eye concealer Radiance Reveal from Bourjois makes eye area more beautiful. It covers dark circles around the eyes, which can appear due to fatigue, decreased skin condition or air pollution. It additionally, moisturises, smoothers, regenerates and oxygenates delicate skin around eye area. It consists of hyaluronic acid, which flattens, so called crow’s feet, highlights skin, and makes look more radiant. Radiance Reveal from Bourjois can be easily used on upper eyelids, skin around eyebrows and inner corners of the eyes to contour face and eye area. Concealer shade should be a tone lighter than foundation shade. How should you apply cosmetics from Bourjois? Apply City Radiance on cleansed skin of face. You can use for it foundation brush, sponge or even fingers. You only have to remember that cosmetic must be equally applied and skin tone even. Then apply Radiance Reveal on the skin imperfections and tap product in with finger tips, it will stimulate blood circulation and relax skin.